Well, the news said this was suppose to be the most depressing day of the year.... That was our local newspaper. Today, my bible said "This is the day that the Lord has made. I will rejoice and be glad in it". And rejoice we did. Frank got word that his lab reports (that he mails in to Little Rock) showed no trace of Myeloma in his blood. That means the treatments are keeping him in remission. Everythings good! We go to Little Rock for a full work up in Feb, but it's nice that we can go over there with such confidence in the results beforehand. Frank finished the 4th and last treatment in the 3rd cycle of his VTD (Velcade, Thalidimide and Decadron for the medical minded). He's tolerated everything very well. His platelets started at 126, and are now 58. But as long as he's not needing a transfusion, we won't complain. My, my, my...how time flies when...well..things are going really well! Sorry for the delay in posting information, and to be frank, Peggy as been holding back on making updates. She has been asking me to post some entries and I've been procrastinating. When I got on here tonight it was confirmed; our last update was Dec 2006. I couldn't believe that it had been so long. Man that was all the way back in last year! Surprisingly I have had few side effects with these treatments - my energy level is really good, my blood values have stayed within reasonable limits, and mostly I haven't gotten sick from some nasty virus or bacteria. In fact, I have started walking/jogging of late. I haven't consistently done that in years. Peggy and I think that with the last transplant they must of given me some "special reserve" stem cells that they had been holding out on me. Maybe these things get better with age, who knows, but I do feel extremely blessed no matter what happened. I return to Little Rock in Feb. to go through an evaluation and then see Dr Barlogie. I plan on asking Dr B. if he snuck something in the transplant cells that he didn't tell me about. I'll let everyone know what CSI Frank-in-Little Rock turns up. Of course with my schedule I probably won't post the answer to the "special cells" question until March or April 08. For me, 2007 has started out as a great challenge. As long as I am feeling good I am going to make the best of things. It also still astounds me at how many of people are still faithful in keeping us lifted up in prayer. I run into to you (people) almost every day and you tell me that you are still asking God for His mercy and blessings on our family. Just so there is no doubt – God has answered and He as said yes, Frank can stay awhile longer! And the beautiful thing about His answer to your prayers is the fact that I have such a renewed sense of purpose. I plan on making the most of His gift. I was able to take the boys hunting with my family after Christmas. 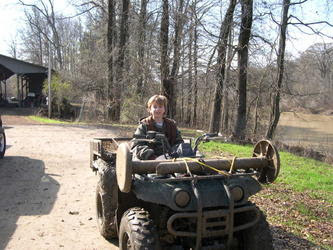 Our nephew Read shot a deer, and as long as we had the 4 wheeler......a good time was had by all! !